I've never been much of a fan of veggie burgers. I ate burgers all the time before I went vegetarian (and later vegan), but the taste of the beef itself was never the big selling factor. As with hot dogs, I liked the form factor: A patty on a bun, convenient and fun to eat. As I found more and more tasty foods that did not resemble animal products either in taste or visual appearance, I gravitated to those. I now generally avoid anything that tastes too much like animal flesh, which I haven't eaten in over 22 years. I do occasionally make something resembling a veggie burger at home. 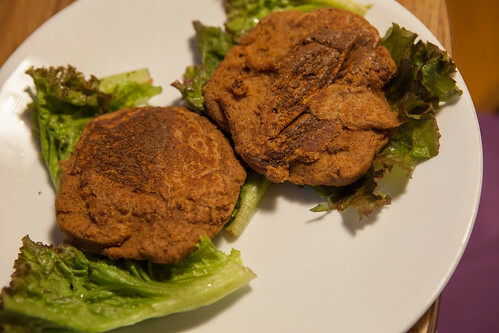 This recipe, Kidney Bean and Peach Patties, is from Conveniently Vegan by Debra Wasserman. While this cookbook focuses on packaged products, I usually buy fresh and make my own. So I used fresh peaches (from the Free Farm Stand where I volunteer) and home-cooked kidney beans instead of the canned equivalents. I also substituted oat flour (rolled oats ground in a blender) for wheat flour. Since I've pretty much given up on finding any tasty SOS-free breads, I had no buns to put these on. I had one on a corn tortilla and another just on lettuce. I'm trying to use corn tortillas basically as a bread replacement, but they don't work well with all foods. The patties were tasty, regardless. As for fries, I sometimes eat some when I go out with a friend, but try not to eat too many because of the oil. When we make them at home, we bake them, oil-free. 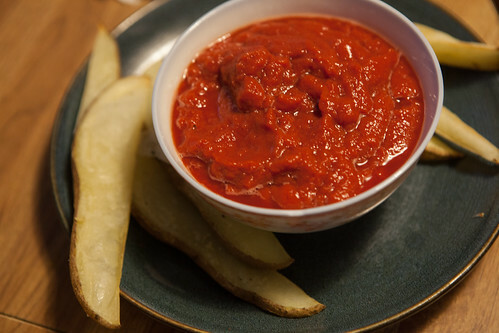 I found a delicious recipe for salt-free ketchup and baked fries on the Straight Up Food web site. This ketchup is so good, it's totally spoiled me and I doubt I'll be going back to using a bottled version. I don't even use ketchup that often, and now I want to find more recipes that use it as an excuse to make this again!